Fewer things are more American than the 5 and Dime store. Perhaps, the best known chain was created by a New Yorker named Frank Winfield Woolworth. The first "Woolworth's" opened in 1879 in Utica, New York. 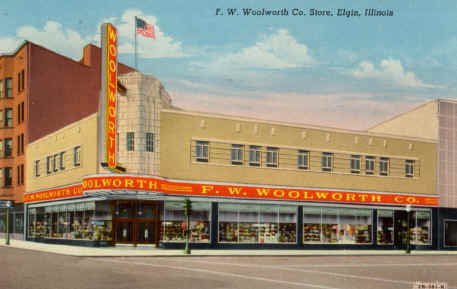 Unfortunately, it closed the same year it opened, but Woolworth would have better success with a store he opened in Lancaster, Pennsylvania. By 1911, Woolworth's was a corporation and could boast over 1,000 stores in its fleet. In 1913, The Woolworth Building in New York City was the highest building in the world, measuring in at almost 800 feet. During the heyday of Downtown Elgin, Grove Avenue, Douglas Avenue, Chicago Avenue and others were beehives of activities. Shoppers scurried from shop to shop, seeking clothes, school supplies, or even a new car. Some of stores that catered to these shoppers were The Theo Swan Department Store, Sears, Akemans, Kresge and, of course, Woolworth's. Originally housed in The Perlman Building, Woolworth constructed a building in 1940-41 on the corners of Grove and DuPage, next door to The Burritt Building. In addition to supplying Elgin-ites with many of the staples of daily living, it also featured a lunch counter. The Woolworth chain folded in the late 1980's. The Elgin store closed its doors in January 11, 1982. The last meal was served on Christmas Eve of 1981. The remodeled building is used today as The Elgin Parks and Recreation offices.